Chelsea Prep College Fair 2013: Class 344 Princeton Tigers! Chelsea Prep's fifth annual college fair is on March 8th, and Class 344 will once again be representing Mrs. Zimmerman's alma mater, Princeton University. In preparation for the college fair, the students are learning all about Princeton. They are working on a presentation to share with the rest of the school. Take a Virtual Tour of Princeton! Click here or follow the link below to take the online virtual tour of the Princeton campus. This tour was created by Princeton students, and if you follow the links through the entire tour, you'll get a good view of the campus. Listen to "Old Nassau," Princeton University's alma mater song! Watch a movie about how Princeton students feel about their experiences at Princeton. Take an insiders peek into four Princeton dorm rooms! 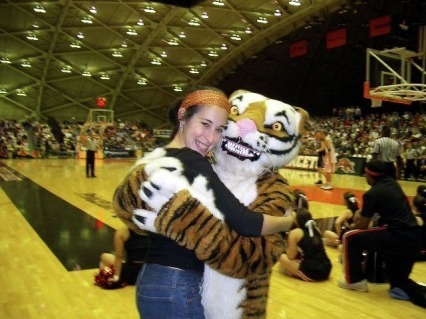 There's Mrs. Zimmerman (as a youngster) hugging the Princeton mascot at a basketball game in Jadwin Gym. Go Tigers! Guess who that is ... Mr. Zimmerman! (This was years before we were married.) 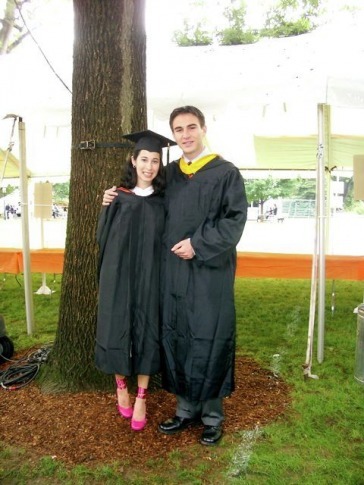 Mr. and Mrs. Zimmerman graduated the same year from Princeton. His collar is yellow because he graduated from the school of engineering. Mrs. Zimmerman's collar is white because she graduated from the school of arts and sciences. Mrs. Zimmerman majored in European history. Read this PAW article about how Nassau Hall at Princeton served as the capital of the United States in 1783. Learn about the history of the Princeton Championship bonfire when Princeton beats both the Harvard and Yale football teams. Princeton has two legendary cannons on campus, each with its own story! Princeton is not only part of the Ivy League, it is also covered in ivy, as seen in this video and this article. Unlike at many colleges, the majority of Princeton alumni return to campus every year for reunions. Movies, movies, and more movies! Check out this huge collection of short movie features to learn more about Princeton, it's campus, student life, and the academics there. 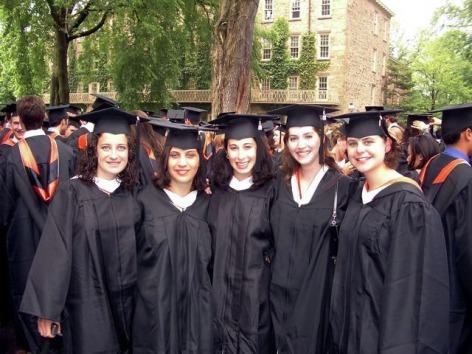 Check out this article for a list of 25 famous Princeton graduates. Will you make this list someday? Learn more about gargoyles at Princeton with this Gargoyle Map, and this booklet about the gargoyles.